A significant oil spill in NY harbor is keeping the critical Arthur Kill closed indefinitely. The Coast Guard reports that the diesel leak from a fuel terminal was contained November 1. The rupture occurred as a result of Hurricane Sandy and has been called a “catastrophic failure of tanks” by Rear Adm Abel. Clean-up continues on the estimated 300,000 gallons of fuel. NOAA and Coast Guard are responding and the Coast Guard Atlantic Strike Team has been deployed. The Arthur Kill separates Staten Island from New Jersey and holds crucial oil supply infrastructure. It is the passageway for container ships to reach Port Newark. Clean-up of comparable spills has taken 1-2 weeks. Terminals in the port sustained damage during the storm, including the flooding of the Philips 66 terminal on the Arthur Kill. The Kill Van Kull was re-opened for vessel traffic today (November 2), but the Arthur Kill remains closed. Addressing both the damage to the port infrastructure and the oil spill are necessary for fully re-opening the port to all shipments. (More details on the status of the oil terminals here.) Popular Science today has an overview of the situation. The Captain of the Port based at the Coast Guard station on Fort Wadsworth, Staten Island closed the Port of New York and New Jersey beginning Monday October 29 at 7 am. This closure of the port, extending a week, is believed to be the longest. The port of NY & NJ is the largest oil importing port in the country and the largest container port on the east coast. NY harbor, normally bustling with vessel traffic, is quiet Friday afternoon. In the distance, vessels are moored awaiting entrance to the harbor. 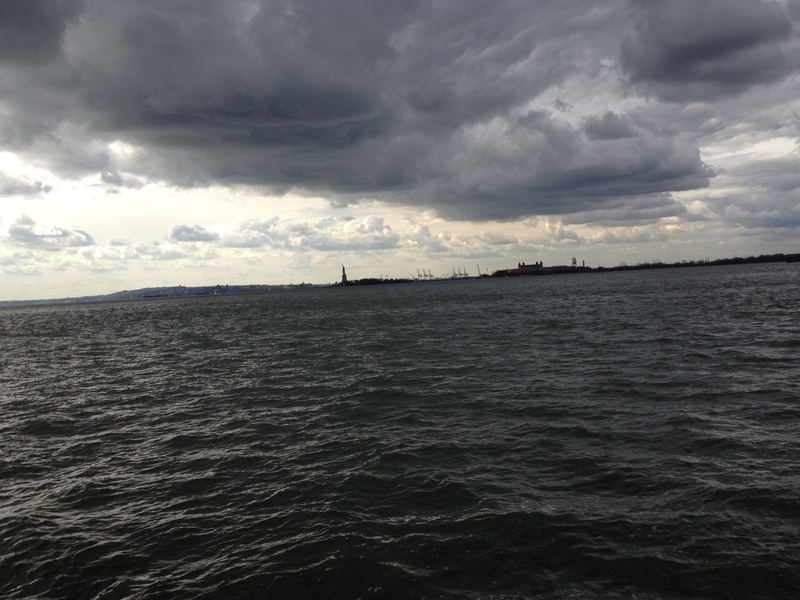 Riverkeeper has been warning about water quality in the city’s waterways as a result of Hurricane Sandy. This entry was posted in Uncategorized, water pollution and tagged hurricane, oil spill, port, Sandy. Bookmark the permalink.